Violet’s heart shaped leaves and delicate purple blooms are perfectly suited to women-specific breast health applications. The nourishing herbal infusion made with Violet leaves and / or flowers can be taken internally to help support the health of the breasts and the lymphatic system. Violet can also be applied directly to the breasts as a poultice. 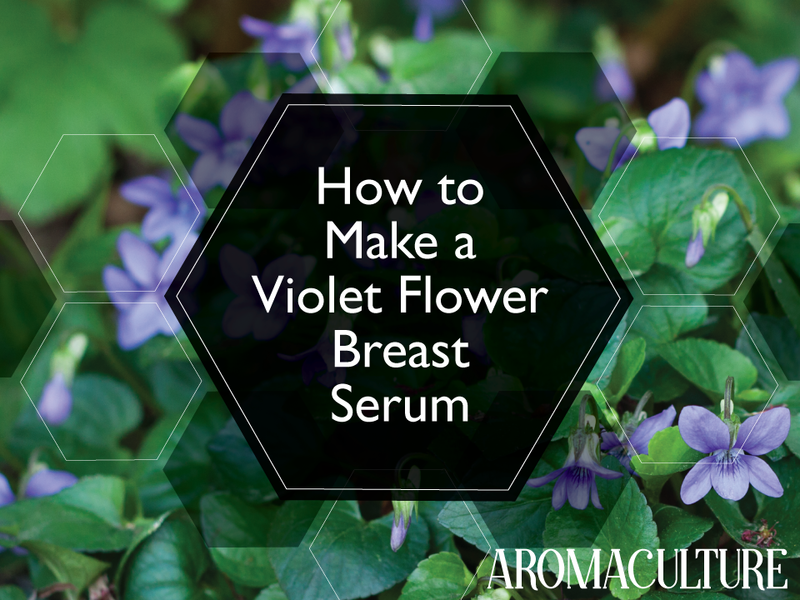 For those of us who may not have time to lounge with Violet on our breasts, though, this serum recipe is a happy medium and it also adds the benefits of massage! Keep a pretty dropper bottle of it on your bathroom counter or at your makeup vanity to remind you to use it each day after you bathe. Violets are reputed to help dissolve lumps, reduce inflammation, induce relaxation and uplift the spirits. They are cooling energetically, so are beneficial whenever there are signs of excess heat. Gently harvest your Violet flowers and leaves on a dry spring morning when the flowers are blooming. Take care not to harvest more than 1/3 of the plant at any one time to ensure the health of the plant. Keep the flowers and leaves covered in your gathering basket to protect them from the sun (a tea towel draped over the basket works well). Once you’ve gathered enough to fill your jar, bring them indoors and spread them out on a clean towel or drying rack, in a single layer, to make sure they are clean, dry and critter-free before infusing them. It's a good idea to let the moisture in the plant material evaporate a bit before infusing. Fill your jar with the leaves and flowers, then pour your carrier oils of choice over the plant material. Olive oil on its own is a bit too heavy and greasy for me for this kind of recipe, so I like to combine it with an oil like Sunflower or Jojoba to improve its texture a bit. Secure the jar’s lid, then leave the oil to macerate for 4-6 weeks. At the end of the infusion period, strain out the plant material. You can transfer the oil to your dropper bottle as needed and add Rose essential oil at a 1-2% dilution (very little is needed; it’s a strong smelling oil). I hope you enjoy this recipe! Do you already make a variation of this? Tell me about it in the comments section.